It is only in less than 10 years, that cell phones started becoming popular irrespective of educated or uneducated. The earliest phones only had the capacity to make or receive calls, text messaging and a few more features. Today we own a phone which has way more advanced features. With the release of the third generation phones- the iPhone, most of us wonder its functionalities and legitimate appearance. Its time to wonder knowing about this pomegranate phone. Have you ever thought about a mobile phone having features inevitable to life? Well we'l explore what makes pomegranate phone give us a breath taking experience. Apart from the basic features like internet browsing, mp3 players, video players, touch screen and GPS, this phone can be used as a projector. You upload a document or a video and mount it somewhere on a table and visualize it on a screen. 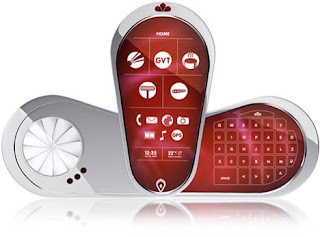 If you are a movie buff planning to buy a home theatre, its wise you buy pomegranate phone. Better portability and easier to us. Global Voice Translator (GVT) is yet another new feature. Pomegranate phone supports 50 languages thus enabling to bring together people of various regions talking various languages. Language is no more a barrier for communication. You speak into the pomegranate phone in your language and the phone translates into the other language you selected for and is received in the other pomegranate phone of the receiver. So no matter which country you go to or which language your friends speak in- unless you own this phone. 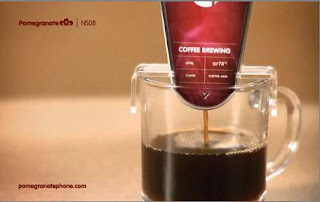 You can now brew your own coffee while you are on the phone- (incredibly) by your pomegranate phone. Select which coffee you wish for and give the phone a glass of water and it prepares coffee for you in no time. For all the people who think their time is too precious to be spent shaving their beards, well pomegranate phone offers solution for that too. It has sharp razors in it which can be used for shaving while you are on the phone. They say they save our time. To be honest, i felt this feature is weird. But still, the phone houses features which are hard even to think. Good try though. And then comes the entertainment part. You can play music through your pomegranate phone like you do in a mouth organ. I came to know this from one of my friends. What he said was- Go to this site and you will throw your phone out. lol, but thats true- I was taken aback by watching the video. But then i felt, the video was worth the wait. Try in different browsers for convenience. Yeah, very funny, especially about making coffee! Thanks for the comment on My Greetings To You. It's a pity you can't blog for cash on Today.com from India. Maybe they will open it up later. If you are looking for ways to make money online, take a look at Team Orangemoon - the widget is in the blog sidebar.